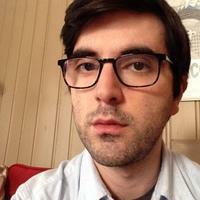 Yair Rubinstein is a PhD candidate in the Graduate Program in Literature. His research interests include Marxist critical theory, (post)-operaismo, labor and automation, contemporary visual/sonic culture, and German media theory. Along with his scholarly work, Yair is also a practicing electronic musician and DJ, who has produced several recordings on Circle Into Square and Hush Hush Records, along with collaborations with various video artists and filmmakers. My research focuses on the intersection of contemporary aesthetics and political economy, paying specific attention to the destablization between work-time/leisure-time, play/labor under late capitalism. I explore the increased instability of these binaries through the production and circulation of current film and sonic media.